QuickBooks 2013 makes it easier for accountants to work with client data files. Your client creates the accountant’s copy of the QuickBooks data file by using his version of QuickBooks and the real data file and then either creates a file that the client sends to you (such as through the mail or via e-mail) or that Intuit, the maker of QuickBooks, sends to you. Choose the File→Accountant’s Copy→Client Activities→Save File command. You can also create an accountant’s copy by choosing File→Create Copy and then clicking the Accountant’s Copy button. A portable file is a real, live copy of the QuickBooks data file that’s been slightly scrunched in size so it’s easier to move around (such as by e-mailing the file as an attachment). A backup file is a backup, second copy of the QuickBooks file you create (usually) so you have a copy of the QuickBooks data file in case something bad happens to the original QuickBooks data file. When a client clicks the Next button to continue with the creation of an accountant’s copy, QuickBooks asks him for the dividing date. Transactions falling before this date can be edited only inside the accountant’s copy. Transactions falling after this data can be edited inside both the accountant’s copy and the client’s copy. Another message appears, telling the client that QuickBooks must close all the windows to create an accountant’s copy. QuickBooks may also tell the client to insert a disk. Click OK and insert the disk (if necessary). 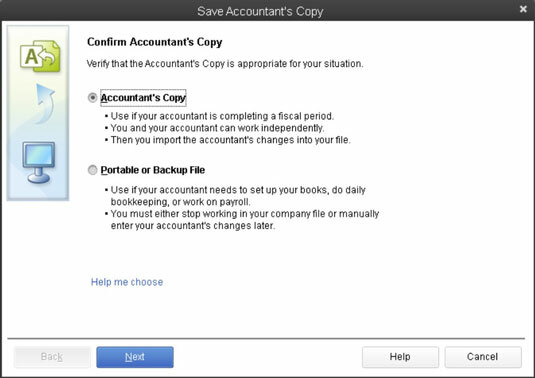 QuickBooks displays the Save Accountant’s Copy dialog box. Use the File Name box of the Save Accountant’s Copy dialog box to name the accountant’s copy of the QuickBooks data file. If necessary, the client can also use the Save In drop-down list to specify where the accountant’s copy of the QuickBooks data file should be saved. The client needs to remember where the accountant’s copy of the file gets saved. This file is given to the accountant — via e-mail or snail-mail, or on a disc — so the accountant can use it. After the client names the accountant’s copy of the data file and indicates, if necessary, where the accountant’s copy should be saved, the client clicks Save. QuickBooks then saves an accountant’s copy of the QuickBooks data file. This data file is then transmitted to the accountant by the client. In other words, the client needs to snail-mail or e-mail the file. Your e-mail provider may limit the size of attachments (including QuickBooks files) that you can send via e-mail. If the size thing fouls you up, you can upload the QuickBooks file to the Intuit website by selecting File→Accountant’s Copy→Client Activities→Send to Accountant. Intuit then sends your accountant a message with a clickable link that she can use to grab the file. Accountant copies make use of three file types. The Accountant Transfer File (with the .qbx file extension) is what a client creates and gives to the accountant. 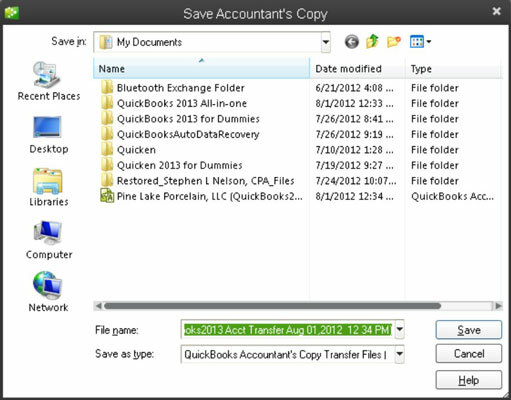 The actual Accountant’s Copy (with the .qba file extension) is what the accountant works with after he or she opens the Accountant Transfer File. And finally, there’s the Accountant Export File (with the .qby file extension).